For September’s reveal, I was given The Novice Housewife blog. Shumaila has a lot of different recipes to choose from and many of them are Indian cuisine. The last time I participated I made a deal with myself that I absolutely could not make a baked good. I had intended to do the same this month but quickly found that most of the ingredients for Indian dishes are just not available around here. Boo! Tom and I have been on a mission to try as many different types of cheese as possible. We’ve found quite a few that we really like, but asiago didn’t top the list. We’re the cheese and crackers type of people and asiago is just too pungent to eat alone. 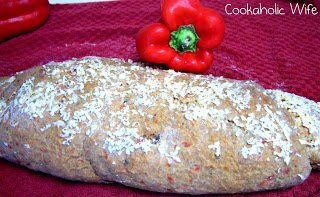 While I was slicing the red peppers for this bread I remembered that Panera Bread sells as Asiago cheese bread and I could easily add some to this recipe. 1. Preheat the oven to 425. Line a baking sheet with foil. 2. Slice the red peppers into chunks and drizzle with olive oil. Bake for 20 minutes until slightly charred. 3. Attach the paddle attachment to your stand mixer. In the bowl of the stand mixer, combine the bread flour, whole wheat flour, yeast, sugar, ground flax seed and poppy seeds. 4. Add the green onions, red pepper chunks, 1/4 cup water and salt to a blender. Puree until no large pieces remain. 5. Transfer the pureed mixture to a small bowl and whisk the olive oil and remaining water in. Pour into the bowl of your stand mixer. 6. Mix on low until the ingredients incorporate and then switch to the dough hook. Mix for 8-10 minutes until a soft dough forms. 7. Turn out onto a lightly floured surface and knead for two minutes or until the dough is smooth. Transfer the dough to a lightly oiled bowl and cover with moist paper towels. Let rise in a warm place until dough doubles, 1 to 1 1/2 hours. 8. Once doubled, punch down the dough and turn out on a lightly floured surface. 9. Gently roll the dough into a rectangle. Starting at one short end, roll up into a log and press the seam in to seal. Line a baking sheet with parchment paper and sprinkle with cornmeal. Place the dough on the baking sheet and cover with a towel. Let rise for one hour or until it has doubled again. 10. Preheat the oven to 400. 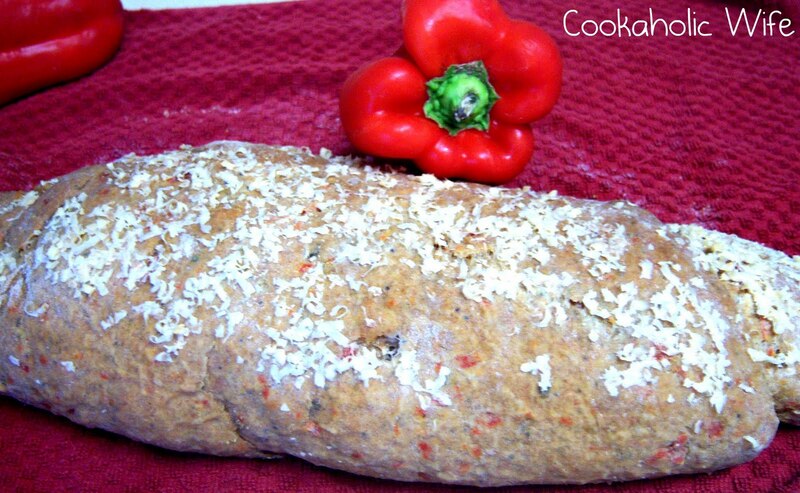 Sprinkle the Asaigo cheese over the dough and bake for 15 minutes. Lower the oven temperature to 350 and bake for 30-35 minutes, until slightly browned. Let cool on a wire rack. I assumed that the sweetness from the red peppers would tone down the sharpness of the asiago cheese and I was right! I made this bread the day before Hurricane Irene tortured those of us on the east coast. My cousin and her boyfriend didn’t want to chance their house with the expected wind gusts so they came to stay at our apartment. We went through this loaf of bread pretty quickly while we impatiently waited on Irene to knock out our power.